The 1917 Constitution of the United Mexican States (as amended, must recently in August 2018), provides that every person Mexico "shall enjoy the human rights guarantees granted by this Constitution and by international treaties to which Mexico is party, which cannot be restricted or suspended except in such cases and under such conditions as are herein provided by this Constitution.”Art. 1(1), 1917 Constitution of the United Mexican States (as amended).Fundamental human rights, such as to life and to freedom from torture, are non-derogable.Art. 29(2), 1917 Constitution of the United Mexican States (as amended).Article 9 of the Constitution guarantees the right of peaceful assembly. According to the 2009 Federal Police Act (Ley de la Policia Federal) (as amended), the Federal Police must “refrain at all times from inflicting or tolerating acts of torture, cruel, inhuman or degrading treatment, even when dealing with a superior order or arguing special circumstances, such as threats to Public Security, the urgency of investigations or any other; to the knowledge of it, shall denounce it immediately before the competent authority”Art. 19(V), 2009 Federal Police Act.It further provides that the Federal Police must “use force in a rational and proportional manner, in full compliance with human rights, while maintaining itself within the boundaries and scope established by the applicable legal dispositions and previously established processes, as well as those established by the present law.”Art. 19(33-34), 2009 Federal Police Act. The rational and proportional use of techniques, tactics, methods, weapons and protocols carried out by the staff of the Federal Forces and, where appropriate, the Armed Forces, to control, repel or neutralize acts of resistance, according to its characteristics and methods of execution.Art. 4(X), 2017 Homeland Security Act. It further specifies that “the acts performed by the authorities for the application of this law shall respect, protect and guarantee at all times and without exception, human rights and their guarantees, in accordance with the provisions of the Constitution, international treaties and the protocols issued by the corresponding authorities.”Art. 7, 2017 Homeland Security Act. The 1993 Public Security Act applicable to Mexico City regulates the use of force in custodial settings, requiring that members of the Public Security Corps shall “watch over the life and physical integrity of the persons detained or in their custody" and “not inflict or tolerate any acts of torture, cruel, inhuman, or degrading treatments to the persons in their custody, even when complying with the order of a superior or arguing special circumstances such as a threat to public safety, urgency of investigation or any other grounds. Should they acquire knowledge of such acts, they must report them immediately to the competent authority”.Art. 17(XI-XII), 1993 Public Security Act. In 2015, in its Concluding Observations on Mexico the Committee on the Rights of the Child expressed its particular concern about the "prevalence of torture and other cruel or degrading treatment or punishment of children, particularly migrant children, children in street situations and children in police custody and other forms of detention". Over the years, a number of complaints have been filed against Mexican leaders, including the then president Felipe Calderon, for crimes against humanity as a result of extrajudicial executions during the struggle against drug cartels in Mexico. The complaints were summarily dismissed by the erstwhile prosecutor, Luis Moreno Ocampo. 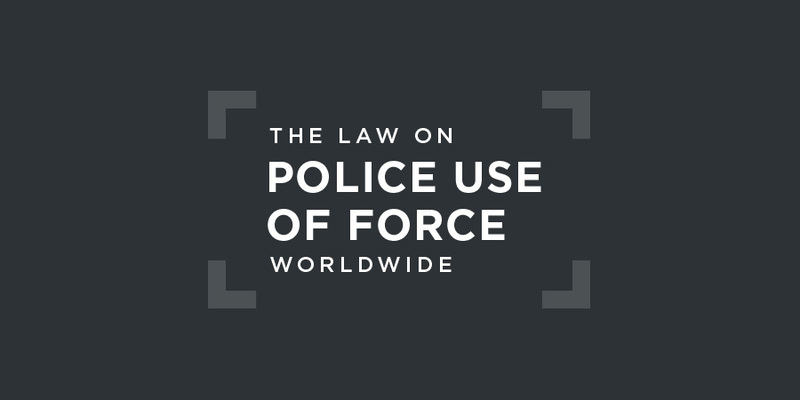 There have been no cases before the Inter-American Court of Human Rights concerning excessive police use of force in recent years. In March 2018, two police officers were sentenced to 25 years in prison for the murder of a Mexican journalist, "marking a rare conviction in a country where crimes committed against media members almost always remain in the realm of impunity." The police officers, identified as Luigui Heriberto N and José Francisco N, were convicted of killing newspaper owner Moisés Sánchez in the Gulf coast state of Veracruz, the deadliest place for journalists to work in the hemisphere. The two officers were also ordered to pay $18,000 in compensation, according to a statement from the Veracruz prosecutor’s office.